Last week’s reports remained modestly positive, although consumer demand showed signs of a slowdown. Consumer demand grows, but more slowly. Friday’s retail sales report showed that the consumer is back—at least, sort of. Headline sales, which include autos, swung from a loss of 0.2 percent (upwardly revised from 0.3 percent) to an increase of 0.6 percent. Core retail sales, excluding autos and gas, increased from a flat performance (revised up from a decline of 0.1 percent) to a gain of 0.3 percent. That said, the annual growth rate rose 2.9 percent in the third quarter. While good, that’s significantly less than the prior quarter, indicating that consumer-led growth may be slowing. Consumer expectations fall. Also on Friday, the University of Michigan consumer confidence survey decreased to 87.9, its worst level in over a year, against an expected increase to 91.8. Consumer expectations did worst, falling to the lowest level in more than two years, even as current conditions rose. This result is consistent with the slowing growth seen in the retail sales report. No surprises from FOMC meeting minutes. Finally, the minutes from the last meeting of the Federal Open Market Committee were released. Fed members seemed relatively united on the need to raise rates, differing primarily in the short-term timing—not a surprise after the dissent revealed in the voting record. As expected, the minutes didn’t change expectations for interest rate increases, but as context for the next meeting, this information was valuable. 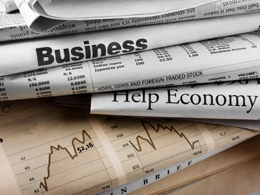 This week’s data covers a wide swath of the economy. Industrial production data for September was released this morning, with a gain of 0.1 percent, in line with expectations. The previous month’s decline of 0.5 percent was revised down from a decline of 0.4 percent. Tomorrow, consumer price data will be released. The consumer price index is expected to increase by 0.3 percent for September, up from a monthly increase of 0.2 percent the previous month. On the year, it’s expected to rise by 1.5 percent, up significantly from 1.1 percent on base effects. Core consumer prices, excluding food and energy, are expected to increase by 0.2 percent, down from 0.3 percent the previous month, but year-on-year changes should remain at 2.3 percent. The National Association of Home Builders (NAHB) will release its survey on Tuesday, which is expected to decline slightly from 65 to 63, still a strong result. On Wednesday, housing starts are expected to show an increase from 1.142 million to 1.175 million, on strong demand, but slower growth in building permits suggests there is some downside risk. Finally, on Thursday, existing home sales are also expected to post a slight increase, from 5.33 million to 5.34 million, although there is also downside risk here, due to lack of homes available for sale.